Artist’s rendering of Tsidiiyazhi abini. Credit: Sean Murtha. (Phys.org)—A new species of ancient bird has been discovered by a trio of researchers working in the New Mexico desert—its fossilized remains were found in the Nacimiento Formation in the San Juan Basin. In their paper published in Proceedings of the National Academy of Sciences, Daniel Ksepka with the Bruce Museum, Thomas Stidham with the Chinese Academy of Sciences and Thomas Williamson with the New Mexico Museum of Natural History describe the fossil that was found and how it contributes to better understand bird evolution after the massive die-off that led to the extinction of most of the dinosaurs. Approximately 65 million years ago, planetary scientists believe, a large asteroid struck the Earth near what is now the Yucatan Peninsula. The impact and its aftermath were so massive that it caused the extinction of approximately 70 percent of plants and animals on the planet. Scientists have been able to piece together what happened to many land animals in the millions of years after the great extinction, but little progress has been made regarding birds. Because their bones are smaller and more fragile, birds do not fossilize as well as other animals. Thus, they leave behind fewer traces of their existence. That is why the new find is so important—because it is helping to fill in the phylogenetic tree. The discovery of the fossil (which the team has named Tsidiiyazhi abini) was actually made by Ryan and Taylor Williamson, 11-year-old twin sons of co-author Thomas Williamson, as the family was out on a fossil hunting expedition. The father and his colleagues returned to the site to unearth the fossil remains and then to study them. They were not in good shape, the team reports, but there was enough material to get a feel for what the bird looked like. The team was also able to date the fossil and to compare it with the few other fossils that have been found in other locations from roughly the same time period. 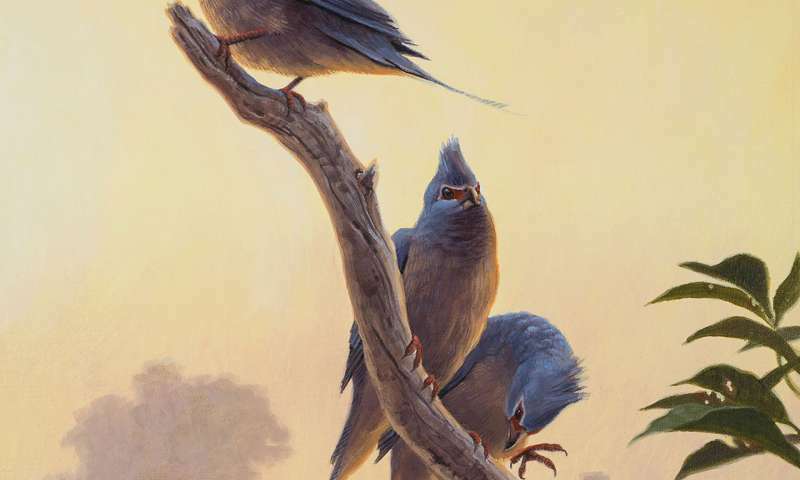 That allowed the team to flesh out the family tree to include as many as 10 major bird groups existing as early as four million years after the great extinction—much earlier than previously believed. The bird was dated to approximately 62 to 65 million years ago, which, the team notes, suggested birds recovered rapidly from the asteroid strike. They note also that the bird closely resembles the modern mousebird, and had the unique ability to turn its fourth toe. This allowed it to turn its body completely about-face—a feature seen with modern owls. 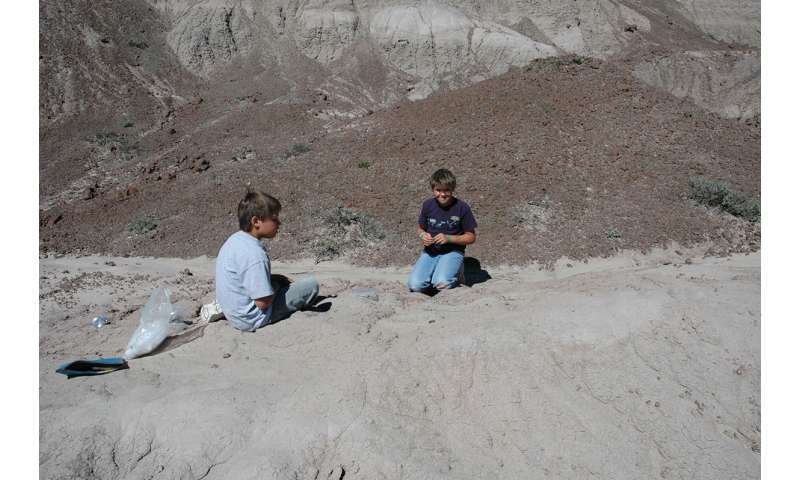 Ryan Williamson (left) and Taylor Williamson (right), the twin sons of Thomas Williamson, discovered the fossil site while on a weekend fossil collecting trip with their father when they were 11 years old. Credit: Thomas Williamson. Evidence is accumulating for a rapid diversification of birds following the K–Pg extinction. Recent molecular divergence dating studies suggest that birds radiated explosively during the first few million years of the Paleocene; however, fossils from this interval remain poorly represented, hindering our understanding of morphological and ecological specialization in early neoavian birds. Here we report a small fossil bird from the Nacimiento Formation of New Mexico, constrained to 62.221–62.517 Ma. 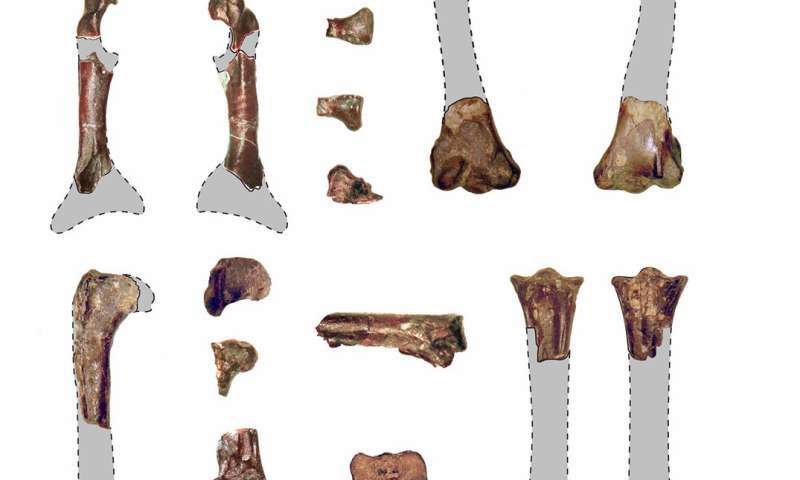 This partial skeleton represents the oldest arboreal crown group bird known. Phylogenetic analyses recovered Tsidiiyazhi abini gen. et sp. nov. as a member of the Sandcoleidae, an extinct basal clade of stem mousebirds (Coliiformes). The discovery of Tsidiiyazhi pushes the minimum divergence ages of as many as nine additional major neoavian lineages into the earliest Paleocene, compressing the duration of the proposed explosive post–K–Pg radiation of modern birds into a very narrow temporal window parallel to that suggested for placental mammals. Simultaneously, Tsidiiyazhi provides evidence for the rapid morphological (and likely ecological) diversification of crown birds. Features of the foot indicate semizygodactyly (the ability to facultatively reverse the fourth pedal digit), and the arcuate arrangement of the pedal trochleae bears a striking resemblance to the conformation in owls (Strigiformes). Inclusion of fossil taxa and branch length estimates impacts ancestral state reconstructions, revealing support for the independent evolution of semizygodactyly in Coliiformes, Leptosomiformes, and Strigiformes, none of which is closely related to extant clades exhibiting full zygodactyly. Maybe ancient is a misnomer.